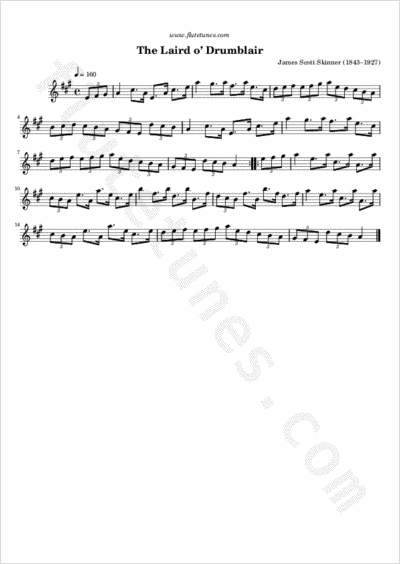 This tune was composed by Scots dancing master James Scott Skinner for his friend and benefactor William F. McHardy of Drumblair, who gave Skinner use of a rent‑free cottage for many years to support his art. In his autobiography, Skinner wrote that McHardy, the Laird, was so impressed with the composition that for the remaining 15 years of his life he sent Skinner a thank-you check at Christmas-time. Suddenly [one night] a tune, 'pat' and complete, flashed into my head in his honour. I jumped out of bed [looking for music manuscript paper]...but a search produced nothing better than a piece of soap paper, and on this I promptly dashed off “The Laird o' Drumblair”. And the tune was dispatched as it had been written.